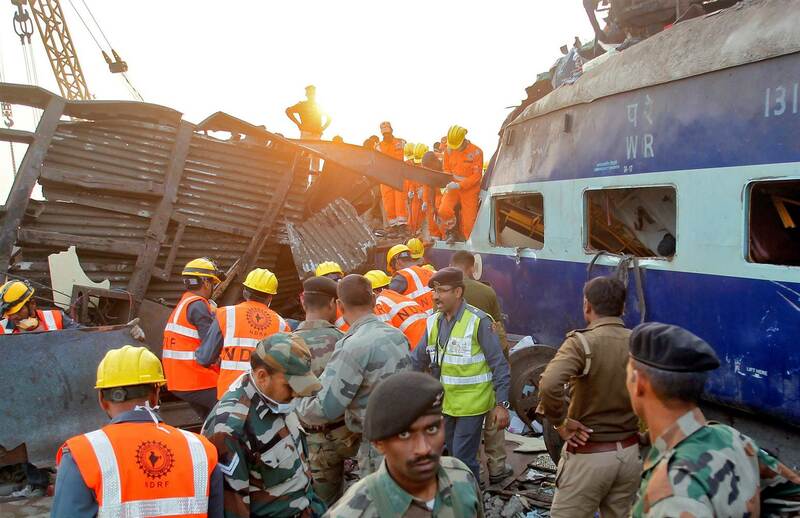 According to NBC News, At least 104 people were killed when 14 coaches of an overnight passenger train rolled off the track in northern India early Sunday, with rescue workers using cutting torches to try to pull out survivors, police said. Daljeet Chaudhary, a director general of police, said the death toll was likely to rise because rescue workers had yet to gain access to one of the worst-damaged coaches. About 150 people were injured, he said. A view of a derailed train in Kanpur, in India's northern state of Uttar Pradesh, in this still image taken from video November 20, 2016. ANI / via REUTERS TV The train derailed at around 3:10 a.m., jolting awake passengers who had settled in for the long trip. The bodies were retrieved from mangled coaches that had fallen on their side. One of the passengers, Satish Kumar, said that the train was traveling at normal speed when it stopped suddenly. "It restarted, and then we heard a crash," said Kumar, whose coach remained standing on the track. "When we came out of the train, we saw a few coaches had derailed." Some of the coaches crumpled when they crashed into others, trapping hundreds of people inside. Rescue workers, soldiers and members of India's disaster management force pulled 104 bodies from the wreckage, said Chaudhary, inspector-general of police in Uttar Pradesh state. Rescuers used cutting torches to open the derailed train cars to try to reach those trapped inside, while cranes were deployed to lift the coaches from the tracks. However, they were moving cautiously because some of the coaches were precariously tilted, and there was a danger of the coach toppling over, possibly injuring those trapped inside. "We are being very careful in using the cutting torches," Chaudhary said. The derailment occurred near Pukhrayan, outside of Kanpur, an industrial city about 250 miles southeast of New Delhi. The Patna-Indore Express train, linking the central Indian city of Indore to the city of Patna to its northeast, completes its 845-mile journey in 27 hours. Prayers with those injured in the tragic train accident. I've spoken to @sureshpprabhu, who is personally monitoring the situation closely.— Narendra Modi (Нарендра Моди) November 20, 2016 Medical teams were providing first aid near the site, while the more seriously injured were moved to hospitals in Kanpur, Chaudhary said. Of the roughly 150 injured, 72 were in serious condition, he said. Police were having a hard time keeping away hundreds of people from nearby villages who were the first to reach the accident site. "We have cordoned off some areas near the coaches to keep people from hampering the rescue efforts," Chaudhary said. Prime Minister Narendra Modi expressed his concern over the derailment. "Anguished beyond words on the loss of lives due to the derailing of the Patna-Indore express. My thoughts are with the bereaved families," Modi posted on his Twitter account. Rescue workers continue at the site of an accident where coaches of an Indore-Patna Express train derailed off the tracks, near Pukhrayan area, in Kanpur, India, on Nov. 20., 2016. RITESH SHUKLA / EPA It was not immediately clear what caused the coaches to derail. Rail authorities have ordered an investigation into the accident, Saxena said. Trains are the most popular mode of transport for millions of Indians, with around 23 million using the country's vast railway network every day. India's worst train accident occurred in 1981 near Saharsa Bihar when a passenger train fell into the Baghmati River, killing nearly 800 people.